This is a note from Rebecca Hersey in reply to The Berry Schools letter that thanks Mrs. Hersey for the donation, but returns the check because she forgot to sign the check. It is assumed that she sent the check back signed. 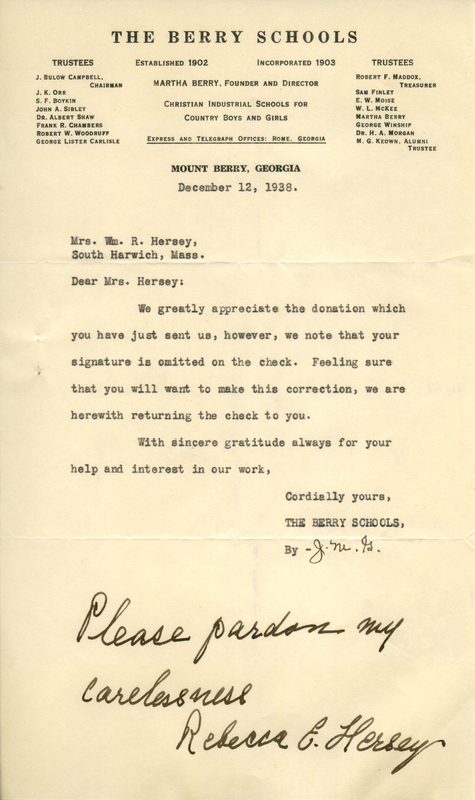 Rebecca E. Hersey, “Letter to The Berry Schools from Rebecca E. Hersey.” Martha Berry Digital Archive. Eds. Schlitz, Stephanie A., Jordan Brannen, Jessica Hornbuckle, et al. Mount Berry: Berry College, 2016. accessed April 23, 2019, https://mbda.berry.edu/items/show/14491.